Mount Sinai, a 2280-metre peak in the south of Egypt’s Sinai Peninsula, is venerated as the mountain on which Moses spoke with God and received the Ten Commandments. One of a collection of peaks in a red-granite mountain range that rises steeply from the plain, with spectacularly sheer slopes and deep valleys, it is not the highest mountain in the region. 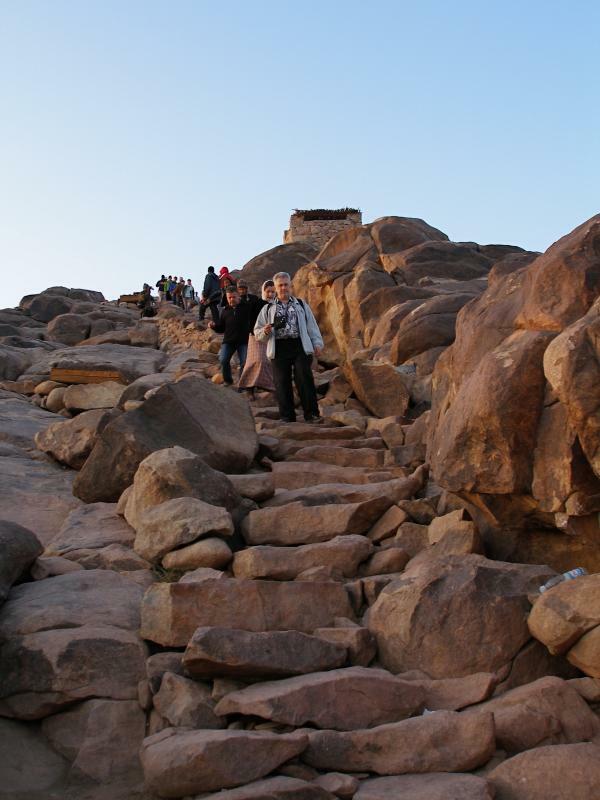 But it may have been called Sinai (“mountain of God”) even before the time of Moses, and it has attracted pilgrims since the 4th century AD. In Arabic it is called Jebel Musa (“mountain of Moses”). Near the foot of the mountain is St Catherine’s Monastery, built over the traditional site of the burning bush from which God called Moses to lead his people out of Egypt. In the immediate area are several other sites associated with events in the book of Exodus, including the place where Moses struck the rock to produce water, and the Plain of Al-Raha where the Israelites camped and Aaron made the golden calf. At least a dozen different sites for Mount Sinai have been suggested — including mountains in the north and west of the Sinai Peninsula, in south Palestine, in Jordan and in Saudi Arabia. 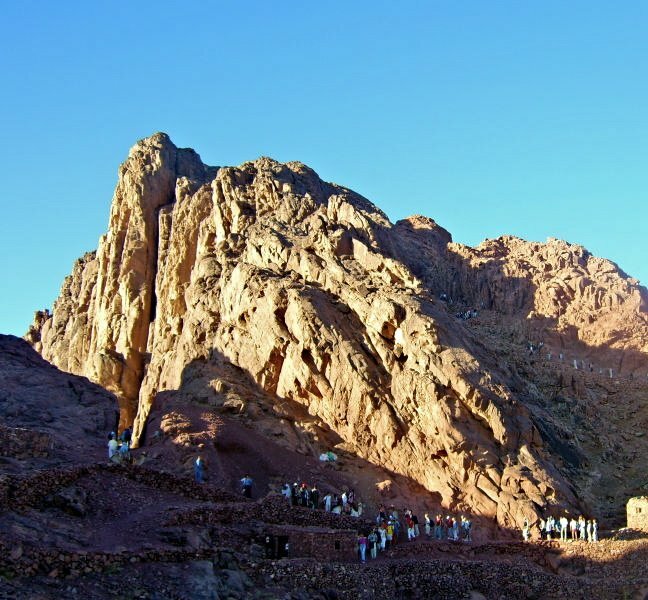 Most modern authorities accept the identification of Mount Sinai with Jebel Musa, in line with a tradition dating back to the 4th century AD. This identification was recorded by the pilgrim Egeria who visited between 381 and 384. By then a Christian monastery was already established at the foot of the mountain. By the end of the 4th century, hermits and small groups of monks from Egypt and Palestine had settled here. There was already a scatter of little churches and apparently already organised pilgrimages to the sites connected with Moses. The Old Testament gives the “mountain of God” the names of Sinai and Horeb, but these references apparently apply to the same mountain. 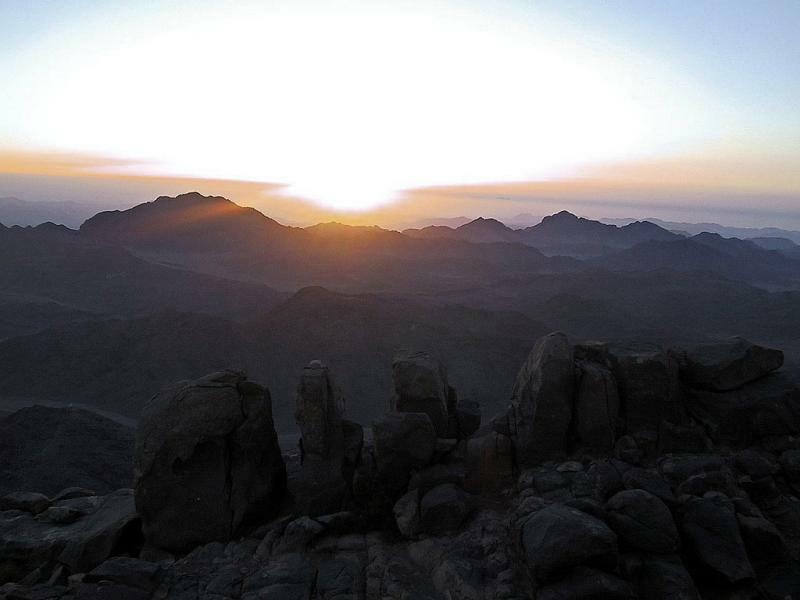 Seeing the sunrise from Mount Sinai is a popular activity for pilgrims and tourists, who often crowd the summit. A 2am start is advisable on either of the two routes to the top. The steeper, more direct route climbs 3750 “Steps of Repentance”, said to have been cut into a steep rocky gorge by a monk as an act of penitence. The longer, less steep track may be ascended either on foot or by camel hired from Bedouin for most of the way, with the final 750 “steps” on foot. At a gateway along the ascent is a small plateau and a cave where Elijah is believed to have waited for God to come to him in “a sound of sheer silence” (1 Kings 19:8-13). On the summit is an Orthodox Chapel of the Holy Trinity, built in 1934 on ruins of a 4th-century Byzantine church. It is said to have been built over the rock from which God took the tablets of stone and its interior is decorated with frescoes of the life of Moses. Nearby is a 12th-century mosque. Both the chapel and the mosque are usually closed. The spectacular view across a panorama of mountain peaks has been likened to “an ocean of petrified waves”.